Erm, let me cast my mind back ... Friday. I'm sure we did something on Friday. Oh yes, how could I forget? Varen had booked us tickets to see Trevor Noah at The Lyric Theatre at Gold Reef City - I ♥ live comedy shows! Varen had heard him on 5fm a while back and thought he was brilliant so booked tickets for us. It was absolutely brilliant. I'll admit I was terrified because when we arrived and sat down, we saw that Varen had actually booked us tickets right in the middle of the row, a mere three rows from the front! OMG. I was like dude, you saw what happened at the John Vlismas show, are you insane? Luckily Trevor Noah is not one to pick on the audience ... shoo! We laughed till our cheeks hurt because man, can this guy put on an accent, from a Xhosa granny to a Cape coloured to a rop Afrikaans Rugby oke. Unbelievable, so so spot on! By the time we left we were so full of food and drink that we just went home and did *nothing*. Varen slept away an approaching migrane and a little later we vegged in front of the tv with Defiance. Don't worry, I'd never heard of it either ... but it was one of very few things at the video store we haven't yet seen and had any sort of interest in ... it had Daniel Craig on the cover, okay? It started out quite slow and confusing and I wasn't quite sure why we'd rented it. But by the end, I really enjoyed it. It was another of those movies based on real-life events that made me want to Wikipedia the real people and learn more about what happened. I kinda like movies like that ... broadening my knowledge, if not by the movie itself, at least by interesting me enough to look up the events for myself. Sunday was quite the admin day ... with breakfast at Caffe Rossini, our weekly shop and a big clean up of the bunny hutch. And then after a little research online about Sore Hocks, we got very industrious. 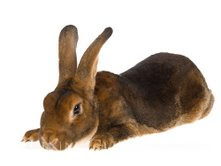 Basically what happens to some rabbits (and Rex bunnies are particularly prone to it because of their unique fur type) is they can start to lose fur at the base of their back feet. Obviously this is *not* good and I noticed in the last week it seems to be affecting little Rexy's heels :( Only a very small amount, but enough to worry me. I knew when we got him that his breed could have this problem ... but I thought it was most likely to occur if they had a wire mesh based hutch so I figured sine ours was entirely wood he'd be fine. Unfortunately after some research I read that wood is equally bad and they need a more spongey surface to walk around on ... grass is obviously best but would be impossible for us. So instead Varen & I decided to cut up our 2 barely-used Yoga mats. Sacrilege, I know :P Honestly I haven't used my Yoga mat in more than 2 years and I'm not likely to start now ... this seems like a far better use for it than gathering dust in my cupboard! In other bunny news, I got some photo's of Rex's dad from the breeder and I can NOT believe just how exactly like our little boy he looks :) (see photo above). I think I'm going to try getting a photo of Rex in a similar pose this week so I can post it for comparison! Sadly tho, we never saw the ending of the movie :( First as we were sitting there watching, the whole cinema went dark and then the screen lit up again and we watched the film burn and melt across the screen. Surreal, I tell you! And then somehow they actually managed to get it started again (I assume they just skipped a few frames to one that was whole) - what a relief. Only for about 5 minutes later the whole of The Rosebank Mall to loose power. There went our movie watching aspirations. The power failure thing has happened to me once before, while watching Kill Bill 2, also, typically, 10 minutes before the film's ending! It's very frustrating, first of all because I am unlikely to go and watch the whole movie all over again just for the ending (good thing I read the book!! ), I'll probably just wait for dvd or something instead. And secondly because although they stamp your ticket so you can get a free movie ticket another time ... when you actually want to use that ticket, you have to go and stand in their annoying queues and book at their counter ... no self-service machine or internet bookings allowed. Sigh, annoying! It'd be so much easier if they could've just given me a discount code or something :P I hate buying movie tickets from an actual person, a waste of my time if you ask me. Same sort of thing happened to us the last 5 minutes of the last lord of the rings movie - my brother threw such a hissy fit that we left with a whole book of vouchers and a refund of our original tickets and snacks. We never did see the last few minutes of that - but luckily I've also read the book.